In Next England Captain the aim of the game is to create the best football player possible and thereby get your player into the coveted role of captain of the England Football team. This is done by playing a series of cards from your hand. There are 6 different kinds of cards representing all aspects of a footballer’s life and career such as skill, team and the popularity of their WAG. Many of the cards have a requirement before they can be played, such as the wife card needs a girlfriend card to already be in play, playing for a premier league team may need your player to be of a certain skill level. You can only play one of each colour card each turn so not only does the game become about playing the cards in the correct order, it also becomes a race to the finish (the World Cup doesn’t wait for you) as every time a player places a card they mark down one of the fiver turn markers. Once all 5 have been completed the game ends. If you discard cards rather than play them then you don’t place the marker. This creates an interesting balance, do you want to play cards as quickly as possible, scoring your cards hopefully before the opposition can, or do you stall for a few turns to get the cards you need? The most interesting mechanic though is the Penalty shoot-out. Before you can discard you have to turn over the top card of the deck and play it. 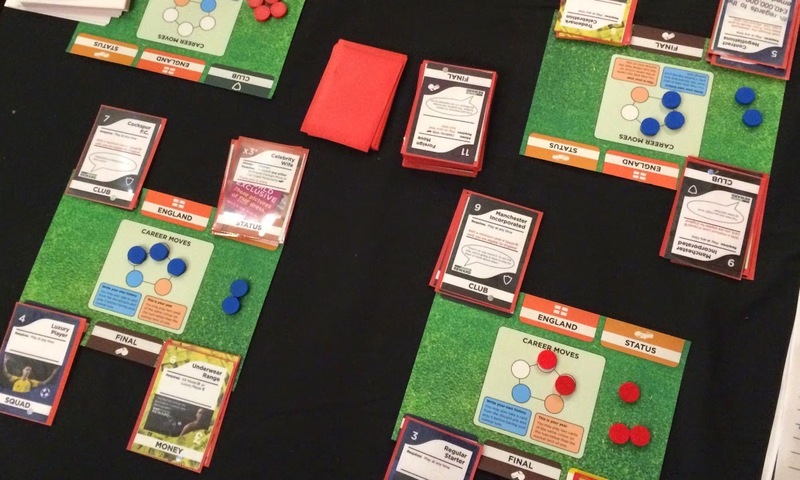 It adds a little bit of randomness and tension into the game, you could end up with an amazing card that falls neatly into your tableau or you could end up with a card that completely screws up your intentions, a bit like England’s history of penalty shoot outs. Next England Captain is a very simple game to learn and play; the rules barely cover one side of paper. It means that you have a light game that’s really easy to pick up. Too Much Games have aimed this at both gamers and football fans alike and I think in this aspect they’ve really hit the mark. I should probably caveat this preview by stating that I can’t stand football and I’m Welsh, which means that the theme of Next England Captain holds zero interest for me but that doesn’t stop Next England Captain from being an interesting game and it definitely wouldn’t stop me from playing the game again. And that is its biggest accolade because it takes something special to make me play a game about a theme I can’t stand. 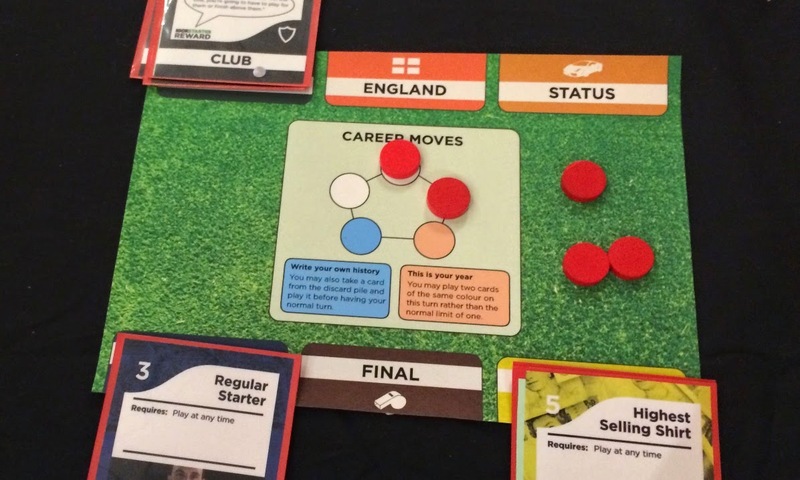 Next England Captain is currently on Kickstarter and the project ends around the same time as the World Cup and don’t forget to check out my interview with the games creator, Jean-Paul Treen.